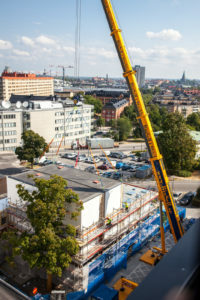 Swedish Modules’ prefabricated modular operating theatres enable Södersjukhuset to maintain its surgical capacity while the hospital is being modernised. In just a few weeks, the operating theatres are ready for commissioning. Through close collaboration and efficient, quality-assured processes, we can deliver a flexible solution that saves costs for the administration and is of great value to patients. 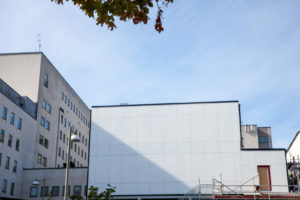 Södersjukhuset Hospital in Stockholm is undergoing extensive renovations, with NCC modernising the hospital in collaboration with the property owner, Locum. 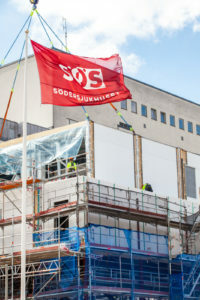 With modular operating theatres from Swedish Modules, Södersjukhuset Hospital can continue its activities throughout the renovation period. These operating theatres are the same ones that Swedish Modules leased to Karlskoga Hospital for two years, and they are now being sold to Locum. “High-quality, safe healthcare is one of society’s most important functions. Consequently there is a need to renovate hospitals. One challenge for county councils has been the need to extend waiting times for care while the hospital is being modernised and the buildings undergo quality assurance procedures. 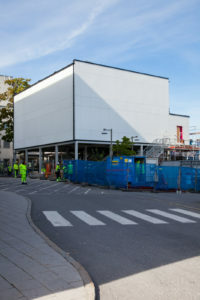 Our prefabricated modular solution eliminates this problem,” says Sven Lans, Site Manager, Swedish Modules. 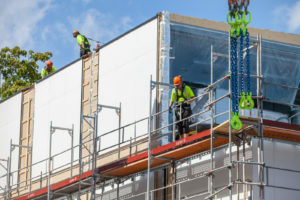 Modular and permanent construction differ in the technique used and the substantially shorter construction period, but their function and the requirements that must be met remain the same. 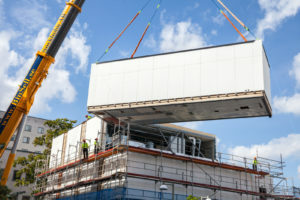 The same regulations apply to modular construction as to permanent. 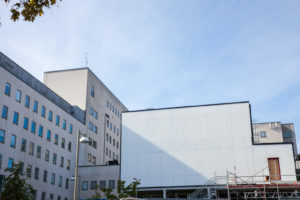 The flexible solution also offers the opportunity to move the modules to other hospitals within the county council that have needs similar to those found at Södersjukhuset Hospital. This practice contributes to increased sustainability from both financial and environmental perspectives. 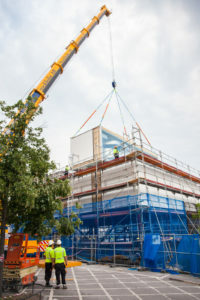 Following delivery to the site at Södersjukhuset Hospital, the modules are ready to be commissioned in just 6 weeks. “We are extremely proud to have the solution to such a complex problem. We also solve it in a way that saves money for the organisation. Along with Locum and NCC, we have created value for both society and the individual. 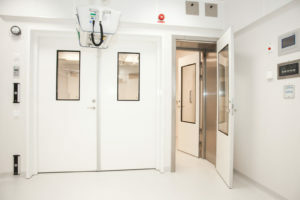 The fact that these are also the same operating theatres that served at high capacity in Karlskoga for two years demonstrates the quality and customer benefit of the product,” says Sven Lans. 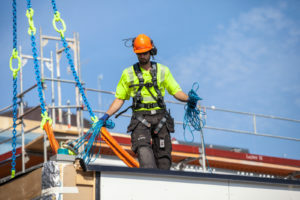 When the modules are assembled on site, safety is naturally the highest priority, along with logistics to ensure that transport to and from the hospital takes place unimpeded. We are extremely pleased that, thanks to good planning and collaboration, transport to and from Södersjukhuset Hospital took place without any delays. The fact that we also need so little time on site for assembly is a major advantage. The modules are expected to be commissioned in mid-September 2018. Total of 8 modules; 3 operating theatres, 3 preparation rooms, 1 technology room (floor 2). 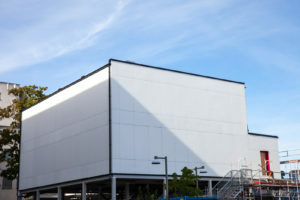 The 8 modules have a construction period of 10 weeks. 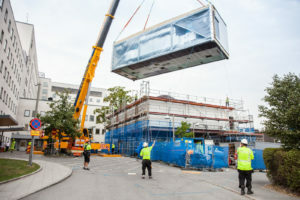 The modules were transported by road to Södersjukhuset Hospital, where they were assembled on site in less than two days. After that, installation took five weeks plus one week for validation. From order to commissioning, we can deliver in about 24 weeks. 8 modules assembled on two floors. Active areas on the ground floor and technology areas on the first floor. Sound baffles for a good work environment. No 90-degree corners, moulding for cleaning. Lead-covered walls, side-hung doors and pass-through cabinets. 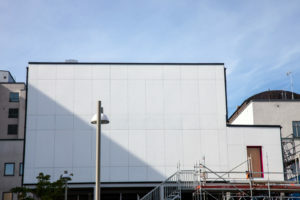 Ventilation built according to the dilution principle. 28 supply air valves / room with HEPA filter. 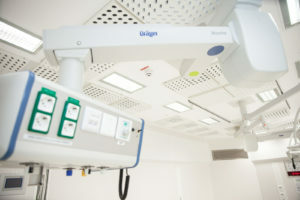 Interlocking system between corridors and preparation rooms, as well as in the operating theatre. 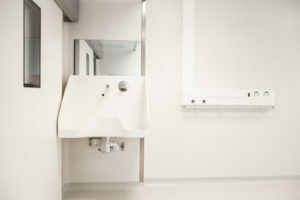 Overpressure in operating theatre approximately 20–24 Pa.
Because of today’s growing problem with resistant bacteria in healthcare, work on cleanliness, ventilation and better workwear on operating wards is becoming increasingly important. 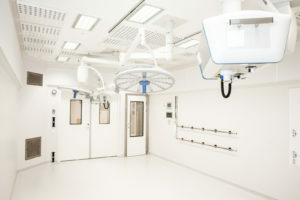 Swedish Modules’ pre-fabricated Operating Theatre concept is the result of a long-term product development initiative that began in 2010 in collaboration with experts in the industry. 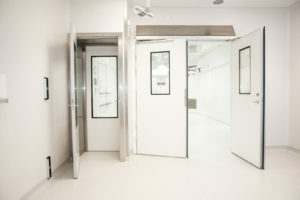 The concept has its origin in a research report (Nordenadler 2008), and the aim of the project was to create a better cleanroom environment for both the patient and the theatre staff. 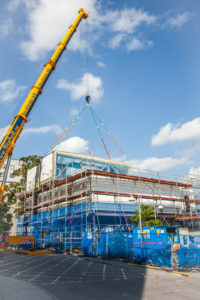 Choosing to build a modular structure makes it easier to achieve and ensure the cleanroom standard and to offer a flexible solution with respect to the needs and functions of buildings, including their format and location and whether the solution is temporary or permanent. The Swedish Modules pre-fabricated Operating Theatre working party included the renowned surgeon Ingrid Ekenman, MD, PhD in medical care and consultant in orthopaedic surgery.